Do you know what I like in a lipstick? 90% pigment. 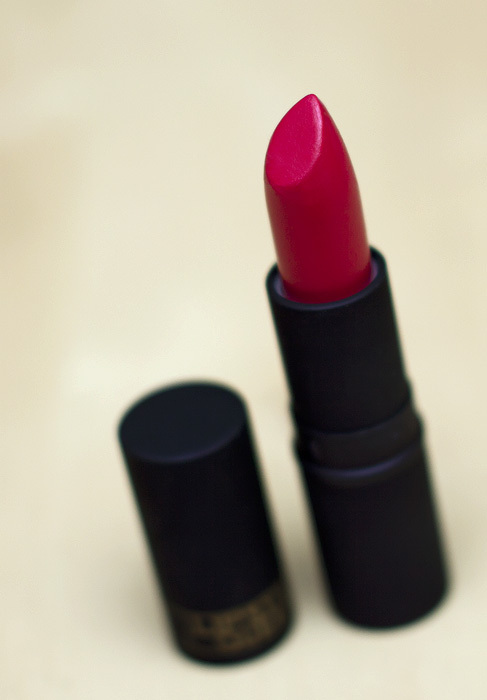 Precisely what you get from the lipstick that I’m showing you today. 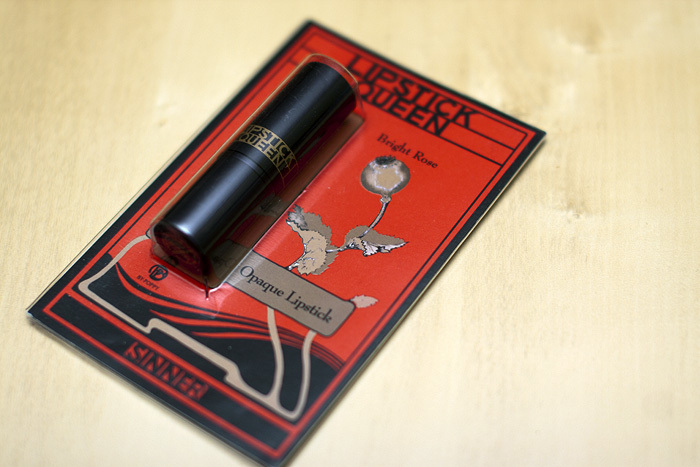 In the Lipstick Queen core lineup, the brand delivers two major formulations, Saint and Sinner. Saint offers wearable shades, optimum moisture and 10% pigment. Sinner presents all colour no filler, a formula that grabs you by the balls and says, “Hey, if you don’t wear me… you ain’t got none.” Oh, and 90% pigment. You see, it’s not that I don’t like sheer lipsticks, it’s just that if I go to the trouble of wearing one, I do like to be able to see it from 400 paces. Housed in devilish red and black card-backed packaging, the lipstick appears quite unassuming in the tube. Sure the colour is there but we all know that appearances can be deceptive and that it’s hit or miss as to whether what you see in the bullet translates to the lips. The Lipstick Queen Sinner line endows a what-you-see-is-what-you- get philosophy… take Bright Rose* for example…. No shimmer, no gloss, just pure almost-matte colour that belies its creamy formula. The beauty of this formula is that you don’t need to grind the bullet into your lips or apply coat after coat to achieve head-turning pigmentation, it’s just there from the start. Sure, it’s not the most moisturising lipstick in the world but I certainly wouldn’t class it as a lip-cracker, I own (literally) a hundred lipsticks that are less comfortable to wear, it’s just not hydrating than this one. Longevity is good, around 4/5 hours before it needs a little touch up, sooner if you eat… fade can be a little unflattering, as with most bright lipsticks and is worth keeping in mind. A beautiful lipstick from an inspiring lipstick designer. 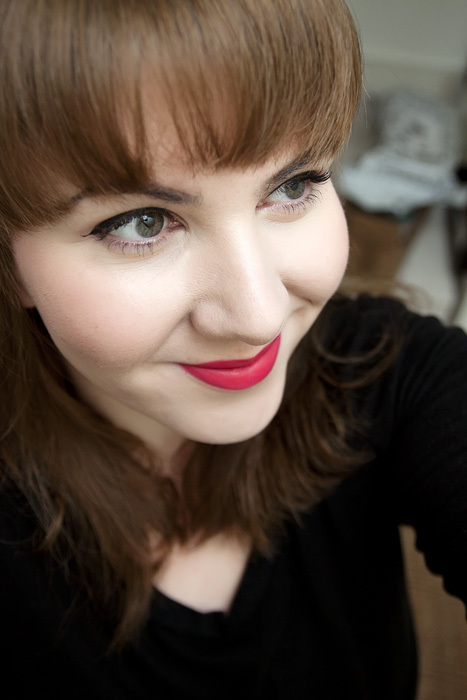 I bought my first Really Bright Lipcolour this week – Ambition by Lush. My first Lush visit, too! I worry it makes me look like someone’s gran ate a satsuma, but my husband says it’s lovely and it does double as a great blush for me. This colour looks stunning! I’d really like to try some Lipstick Queen stuff but they’re too expensive for me right now I’m baffled by the 90% pigment though, I’ve been making my own lipsticks and I have no idea how you could even get 90% pigment into the mix and have it remain an actual lipstick! Drooling all over this one, the cute vintage card it came on is fab as well! By golly that is purdy!